Vietnam offers cultural experiences like no other, incredible natural landscapes, and places to relax and rejuvenate. The best times to visit Vietnam are in the Spring (from February to April) or in the Autumn (from August to October). Half a century has passed since Vietnam was the war-torn nation the world once knew, and in that time it has healed and begun to flourish. Consider visiting the astonishing scenery of Halong Bay, the chaotic and bustling city of Hanoi, and the spectacular caves of Phong Nha-Ke Bang National Park. 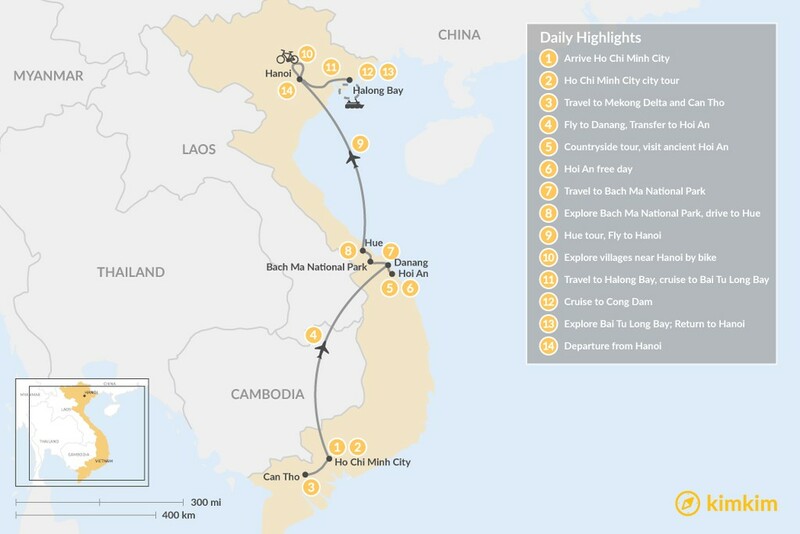 Travelers typically spend at least 2 weeks in Vietnam, although you can still put together a great trip in 7 days. This two-week tour starts in Ho Chi Minh City and ends in Hanoi. Cycle around traditional farming villages, hike through national parks, explore grand architecture in Hoi An and Hue, and cruise around mesmerizing Halong Bay. Hitting all of Vietnam's highlights, you'll take in the very best this spectacular country has to offer. 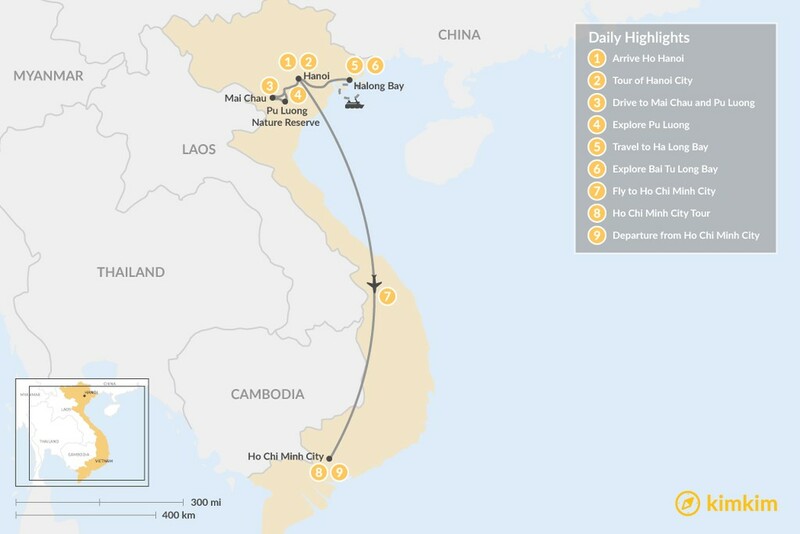 See all the classic highlights on this nine-day trip to magical Vietnam. Roam around the bustling streets of Hanoi and Ho Chi Minh City, cruise on the azure waters of Ha Long Bay, and hike to villages and terraced rice paddies in the countryside. This tour is ideal for first-time visitors or travelers with limited time who want a well-rounded showcase of Vietnam's history, charm, and natural beauty. This tour takes you around the major highlights of Vietnam, but along the lesser-traveled paths. Visit the coastal regions of Northern Vietnam that still remain unknown to many visitors. Get immersed in Vietnamese history in Hue, and experience a different side to popular Hoi An by being a local for one day. And of course, visit bustling Hanoi - the capital of Vietnam - which seamlessly blends the old and new. Vietnam is a culturally and geographically diverse country, which you'll see first-hand on this tour covering the highlights of the north, central, and south. 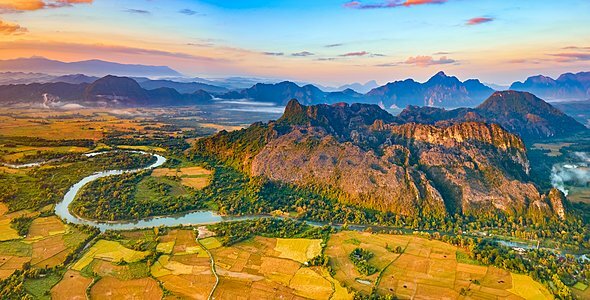 From the incredible karst formations of Halong Bay to the totally flat Mekong River Delta, the beautiful merchant houses of Hoi An to Ho Chi Minh City, you'll fall in love with Vietnam's wide array of sights and activities. Vietnam is made up of over 52 different ethnic groups, all with their own customs, dress, architectural styles, and languages. Trekking through the mountains along the Vietnam-China border, you will stay in the homes of Red Yao (Dao), Zay (Dzay), Black Hmong, Xa Pho, and Tay villagers. This journey takes you through terraced rice fields and farming villages, enjoying local hospitality along the way. Wonderful experience and I felt taken care of . Traveling as a single woman I felt very safe. Thank you for crafting a once-in-a-lifetime experience for my son and stepson. We had an amazing time in Vietnam under the care of Sens. I’ve traveled to many places around the world, and I think Vietnam may very well be my favorite place. The food is wonderful, the scenery is gorgeous, and above all, the people are so kind and optimistic. Regarding the tour. Mr. Khoa was an outstanding guide. He was pleasant, patient, and knowledgeable. He went out of his way to make sure we stopped at interesting places and beautiful views. Our accommodations were great. The hotel in Hanoi was very well located, and the staff was attentive. The rooms were very spacious and clean. Our visit to Mai Chau was outstanding. Our lunch was tasty, and the “homestay” was a fun and delicious experience. We very much enjoyed biking through the villages. I hadn’t been on a bike for 20 years, but it’s true that you don’t forget how, and it was so much fun! Again, Khoa made sure to stop at interesting places and explain what was going on. Our driver was excellent. I always felt that we were in safe hands as he navigated the crazy streets of Hanoi, and the winding roads in the country. Our visit to the school in Mai Chau was wonderful. We’d bought some soccer balls and badminton sets in Hanoi under Khoa’s recommendation, and they went over very well with the staff and students. We were warmly greeted by all of the staff/teachers, and were treated to oranges and conversation before we got a tour of the school. There was one young student in particular who was a wonderful conversationalist in English. He is a particularly fond memory. I’m glad that you convinced us to go to Bai Tu Long Bay. It was stunning. The host on the Swan Cruise, Marcus (Minh) was very engaging and fun. I liked the size of the group on the cruise—being somewhat small. While on the Swan Cruise we met a Vietnamese woman from Hanoi who was traveling alone for the first time, and rounded out our table of three to a table of four at mealtimes. In such a short time, we became friends, and continue to communicate! None of this could have happened without the fantastic work that Linh and Ha did to pull this all together for us. Gam un! I hope to visit Vietnam again one day, and look forward to you helping plan a trip to visit the South! In the meantime, I wish you all the very best. the trip was amazing and we were well looked after throughout! Especially the Tu Lan cave-trip was absolutely stunning and amongst the best I have ever experienced. The kids were completely in awe and we will all never forget the trip, the many friends we made and the many experiences we made. It is impossible to list all the other experiences but clearly, each component had its own value and exceeded our expectations. Our guide for the food tour was very good, friendly, knowledgable and explained a lot. Hung, our guide from Oxalis was amazing. He adapted the tour for us, added an additional cave (which required a lot more climbing), and was full of energy and fun. Ni was an excellent guide with lots of energy making sure we always get the best out of it. She adapted the programme perfectly around the weather (rain, rain, rain) and our interests. 2.) The hotel in Phong Nha (I think we were in a different than in the programme) was not the greatest. I would suggest two possible improvements: a) IF staying in this hotel it should be highlighted that they can wash the clothes from the treck but the laundry should be handed in before 6pm to avoid express charges - this could then be in the programme and used to plan packing and getting things clean and dry again after the treck. b) It would also be good to allow for a late breakfast. After the trek we were super-tired and a sleep-in, then breakfast, then cartrip would have been appreciated. b) Alternatively, rather than staying overnight in the Phong Nha area the car trip to Hue could be done immediately afterwards. This would allow us to sleep in the car but gain a whole day. 3.) The hotel in Hue was quite loud with lots of party across the road. 4.) In Hoi An the first fisherman experience was superb. Friendly, happy and "off the beaten path". The second fisherman village was then very touristy and a bit of a shock. The basket boat row could well have been done with the first fishermen (or skipped). Maybe alternatively, one could learn about local ways to grow crop and harvest and process it. 5.) The Mekong trip was interesting, but somehow less exciting than the previous parts of the trip. I had expected more nature and was a bit disappointed. In total we spent too much time driving relative to the experiences made. While it is important to understand that various religious groups live together in harmony (and I think it reached the kids that this is by no means the standard), the visit to the Cham village was rather disappointing. It also feels wrong to walk along a street and look at people. The floating market was nice but the number of tourists outnumbers the locals. Tra Su made up for it (but only lasted for about 1 hour).... We had fun in the evenings though, eating locally, strolling around and enjoying the locals (who enjoyed us...). If a "Mekong Experience" could be organised from HCM - maybe in combination with the tunnels it would save two days and a lot of driving. I would then rather spend another day or two in the Tu Lan area. Alternatively one could try to save a day and use the time to see Angkor What. It would also be nice if the car had internet for the long drives (the car from Pho Nah to Hue to Hoi An to Danang had internet which was very welcomed). 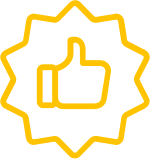 As said, these comments are not a criticism, we thoroughly enjoyed our journey, were exhausted from all the input (and still are), and thank you again for the great organisation and putting such a dense and exciting programme together.